Tim, I’m not sure how old this article is, but I do have some anecdotal experience with this. I have one of the early model playstation 3s (the ones that still supported SACD playback) and a few discs that have both CD and SACD layers on them. I re-purchased a couple of my favorite albums to see if I could tell the difference, and my partner (who was 2 rooms away) said she could tell the difference from there. Having studied music and heard her sing, I can tell you she is totally tone-deaf. This was on one of the cheapest surround sound systems available (AUD$1200 for receiver and speakers). Even though it does HDMI switching, it can’t even decode the audio from HDMI. I have to play SACD through stereo analogue cables. The PS3 is far from being a top-of-the-range SACD player as well. But the difference is positively startling. I used to think the sterile sound from CDs was the digital format itself. 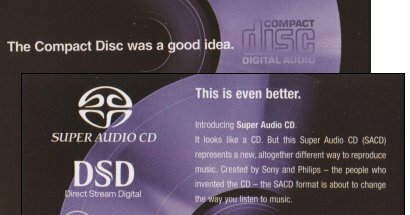 But my experience with SACD totally disproves that. I also agree with the comments about double blind tests. Human perception is totally malleable and we even change what we perceive as we perceive it, based on our own expectations and prejudice. But when you experience the same album in two formats back-to-back, the differences are very clear between SACD and CD. None of that makes music on CD (or MP3) any less enjoyable, but given the choice I’d go SACD all the time, same as I’d choose 1080p (or higher resolution) video over 720p or SD any time. I just wish the catalog of SACD titles was larger and the discs were cheaper (same with Bluray). @Craig one of the problems is that the CD and SACD layers may not be mastered to sound the same. The CD layer may be more compressed – to sound more like other CDs. 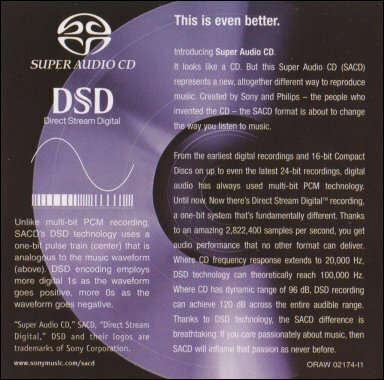 Another issue is that any particular machine may perform better on SACD vs CD. There are too many variables; which is why leaving the playback source as-is and inserting an additional conversion loop is a better way of testing im my opinion. @Tim: I definitely agree with the point about mastering decisions and sources. The simple tests I performed were done with two discs. One was Norah Jones, which has both SACD and CD layers, and the other was Pink Floyd DSotM (using separate discs). I would expect the mastering choices on the first to be nearly identical. But DSotM would certainly be different as the SACD was re-mastered for multi-channel output. It’d be interesting to repeat the test again with a decent receiver and speakers. The most surprising thing I found with SACD was the level of detail in the audio. You could hear sounds in the SACD version that didn’t exist in the CD version, and the spacial quality of the audio was miles apart (no pun intended). I understand how convincing this kind of test can be. At the same time, it is hard to think of any technical reason why going from 16/44 to hi-res would make new sounds audible, other than mastering differences not related to the difference in digital resolution. The thing to to is to take the high-res audio, convert it to 16/44, then do a blind test between the two. Or better still, insert an additional 16/44 loop in the signal as in the test referred to in the article. Just a note to the poster above re: Norah Jones SACD. If you’re comparing SACD & CD layers of “Come Away With Me”, the SACD layer is supposedly a DSD copy of the CD layer! Therefore, there should be absolutely NO difference (at worse, the PCM –> DSD conversion degraded the sound!). Hello. This is a very interesting topic here. I wanted to compare PCM sound to SACD before too. I took the Norah Jones SACD layer and recorded it onto DAT at 16bit 96KHz. Even at that high sampling rate the SACD is still much clearer with alot more realistic sound. The sounds are definitely more true to real life. Hands down SACD won over the PCM. Just to add my ha’penny worth to the debate. I’ve been using cd, minidisc, sacd, dvd-a, cassette and vinyl in a modest but fairly revealing hi-fi set-up for many years. The first eye-opener (or should it be ear-?) with regard to high resolution audio was an SACD of Toto’s album IV. The first track (Rosanna), revealed a constant cymbal riff that I had never before heard on radio, cassette, CD or LP. Knowing it’s there now, I still have great difficulty hearing it on CD if at all but it is crystal clear on SACD. I’m pretty certain it’s not due to any sort of remix, as the overall sound is almost identical except for the increased level of detail and seperation of instruments that I have noticed with the higher resolution of SACD. Another album that has bowled me over is the SACD of Al Jarreau’s All I Got . The sound is so lifelike that it’s spine-tingling. There are 3 elements which immediately stand out: first the crispness, punch and complete start-stop of each element of the mix – there’s no overhang, it just stops dead where it should as in real life. Secondly the fullness and warmth of the sound – it feels like there are no limits to the deepness of the bass and the treble extension (apart from my speakers limits). Lastly, the sense of space around each voice/instrument, as though the whole atmosphere has been captured, not just the sounds. My other favourite album is the RPO’s own SACD of Rachmaninov’s 2nd Symphony. The realism of the orchestral instruments is stunning, and the music builds and builds into a climax that goes way beyond any CD I have heard (and I have a LOT of classical CD’s). However, now for the downside. I suspect that record companies are using SACD (and the dying DVD-A) simply as a way of presenting surround sound versions of albums, without significantly increasing the resolution. Thus a DVD_A of Fourplay sounded exactly the same as the CD version on 2 channel audio. Some recent SACD releases (and remixes) of Elton John and Genesis have to me sounded more compressed and harsher than the original CD’s. So we may eventually see the demise of true high resolution stereo on SACD and DVD-A in favour of CD quality surround sound! Thanks for the comments. I know that there are many SACDs that sound great, but that doesn’t answer the question of whether this is to do with hi-res itself, or just that the recording was better mastered or from better sources, or some other factor. This can’t be resolved without rigorous listening tests in controlled conditions, of which there are few. Just found this, so I’m joining the discussion late in the game. 1. If you hear “details” in the SACD that you have not heard on the CD, put the CD back in the player and see if you hear those details now. 2. I have a reasonably good, but not top of the line system (no SACD though). Some time ago I was given (a sort of indefinite loan from a good friend) a pair of Tara Labs Air RSC 1 interconnects. Without delving too deeply into a discussion on cables, the amount of additional detail, depth and “air” I heard on the same CDs was breathtaking. Really. I would have always thought (I’m not an engineer, just a moderate audiophile) that a higher sampling rate simply makes the digital sine soundwave less jagged, so the sound is more “analogue”. Amount of “detail” does not necessarily have anything to do with it. It doesn’t work like that. There is nothing jagged in the wave; but it is frequency limited. However the additional frequencies that can be reproduced by high-res are inaudible by humans. Additional problem with SACD is no possibility to RIP to the disc. After many checks I have now really good system to listen from by server database (based on Ayre QB-9). For me it’s better (more “analog” and detailed) than SACD content from rather good SACD player. Unfortunately, I don’t know the procedure, to rip convert SACD to 24/96 PCM, so in this case I cannot compare SACD and CD source. You and your readers might be interested to know the Soundkeeper Recordings Format Comparison page now includes 192k samples (in addition to 96k and 44.1k) from our latest release Equinox. I’m not convinced that a double blind test where you are asked to identify between A and B is necessarily definitive. I may not be able to tell consciously which is which in a ‘laboratory’, but perhaps in the right surroundings and ambience and listening to the right music, I might only find the hairs on the back of my neck standing on end with the higher resolution format. Or maybe my ears may simply be less ‘tired’ with the 24/96 allowing me to listen for longer, louder. It’s impossible to measure and prove it though. My guess is that 44 kHz is uncomfortably close to the limit for the desired 20 kHz response, so that there may be strange effects going on right at that top end. And even if our adult ears can’t hear those effects as such, they may be able to hear them when the high frequency components present in the two stereo channels ‘beat’ together in the air before reaching our ears. So if I had to bet on it, I would guess that there is some value in stretching to 24/96, but that it may never be demonstrated objectively. An interesting point, though most people assume that because differences in things like loudspeakers (and, I would have thought, microphones) are easy to hear, the ABX isn’t worth doing. But I’d like to see more of these kinds of tests. Seems plausible to me. I have a small collection of hi-rez recordings and I think they sound better. When I downsample them to CD I am not that sure I can hear the difference. I think I can, but I would not bet on it in a blind test. Most differences probably are in the mastering. One reknowned writer carries CD-R’s recorded from his megabuck turntable that are purported to sound massively better than the commercially released CD’s. This is supposed to prove the superiority of the vinyl LP. Most people don’t seem to see the lack of logic in that. What format is the getz and giberto file as played by foobar? I’m a little late here, but want to make a few comments. 1. Most modern CDs and other recordings have their dynamic range modified (loudness wars). When I compare a high quality Frank Zappa LP to his same 90’s CD there is about 10 dB or more dynamic range on the LP (when checked using Adobe Audition tools). You will almost always enjoy the LP more than the modern CD. However, LPs introduce other distortions such as S-filters, bass reduction to pack the grooves closer, feed-through from adjacent grooves and feed-back from loudspeakers. These are still not as bad as dynamic compression. There is no easy way to compare LPs and CDs, but more dynamic range will usually sound better (can be played louder and you will hear more going on). Also, most computer A/D boards introduce high frequency noise peaks as well as digital noise from the computer, so the quality of your recording setup can affect results. 2. LPs do sometimes have sound beyond 20 KHz, but it most likely is harmonics generated by the needle shank and magnetic non-linearities. The RIAA filters tend to roll off quickly above 20 KHz and aren’t really defined beyond that region. I copy my LPs to 96K/24 for repeated listening, but this may be overkill. 3. When comparing 192 KHz or 96 KHz 24-bit recordings to 44.1 KHz 16-bit you need to consider the source of both. 44.1 KHz doesn’t divide evenly into the higher bit rates unless you use 88.2 KHz for the master. Most audio conversion programs used on personal computers are not designed correctly to convert either the frequency sample rate nor introduce proper noise shaping at the 16-bit noise floor. They will introduce distortions that some golden ears may be able to hear. Most modern recordings only use the top 20 dB of the sound range and you won’t hear this distortion in a 16-bit source. If you listen to a good recording of Stravinsky’s Rite of Spring at high volume, almost any one should be able to tell the difference between 96K/24 and 44.1K/16, even with old ears like mine, because the quite passages will be colored by the quantization noise. But then again, it could simply be poorly written conversion software. There are a lot of other factors that can color your sound experience, even with proper ABT. Good article and although an older topic, I just wanted to chime in here about the fact that digital ripping of SACD’s can now be performed with older model PS3’s with the appropriate firmware. These are just a few I bothered to keep track of especially from audiophile labels (like MFSL and Stockfisch)… Numerous others were suspicious as well. Yes, different masters are being used for the SACD vs. CD layers as well – an example would be John Mayer’s Heavier Things (2003) where although both layers are dynamically compressed, the CD layer was worse. Bottom line – ya never know what you’re getting with these SACD’s. Sound quality comparisons remain extremely difficult especially since probably almost all studio recordings and multi-track material have at some point gone through a PCM -> DSD conversion step along the line which probably has caused some sonic degradation already (may not be all that audible). One more thing… Not to just pick on SACD, DVD-A also has its issues with many of the releases. A good example I came across is R.E.M. “Around The Sun” which came out in 2004, during a time when the major record labels were pushing for hi-res and surround music adoption. It wasn’t until 2005 that DVD-A could be digitally ripped. It’s going to be interesting what the future holds for high-res music. For those who have downloaded new pop / rock releases from the net (eg. HDTracks), have a look at the dynamic range with something like the Foobar Dynamic Range plugin. Many of these 24-bit releases have DR’s of 7 to 9 (eg. Joe Walsh “Analog Man”, Muse “The Second Law”, Steve Hackett “Genesis Revisited II”, Smashing Pumpkins “Oceania”); no better than the respective CD and not deserving of 24-bits IMO. Even if high-res audio CAN sound better, what’s the point when the mastering effort remains so poor? James, re your point 4, a properly mastered CD won’t exhibited any quantisation distortion at any output level. Dithering and noise shaping eliminates quantisation distortion, shifts the noise into less audible regions and increases dynamic range. On a good CD, the quietest parts of your Stravinsky even played very loudly should just have gentle background hiss at maybe – 106 dB down. If you have the volume such that you can barely hear the background hiss, that’s probably about 30dB. So the loudest sounds could be 136dB, ie. blow your head off. Far louder than any orchestra under any conditions. What I am really saying is that CD has more than enough dynamic range to reproduce any orchestral music without audible distortion. Of course the producer could butcher the mastering, but the format itself should not be a problem. Can I ask a really simple question? If you’re are attempting to replicate a 20kHz sine wave with 44k samples per second you will only have just over 2 samples per cycle. So if you happen to sample on the peak you get loud 20khz square wave, but if you happen to sample as the sine wave crosses zero you get nothing. Therefore have 4 sample per cycle, like 96kHz would seem very beneficial. Tim’s statement that it has a lot to do with mastering si likely to be true. In the analogue era the quality of the LP dependent upon the quality of the recording gear and could already record inaudibly high frequencies. As everything above 22kHz would fold down in the audible spectrum due to aliasing a analogue low pass filter had to be used to bbecame e able to digitize this. In these filters the reason lies for the deterioration. Probably nowadays still a lot of recordings are made that way. When higher sampling rates became available these filters became much easier to implement without sacrificing much audible quality anymore. After that downsampling to the redbook format is a breeze and will hardly impact audio quality anymore. Only those persons with really golden ears wil hear that frequencies above 11kHz are not so neatly shaped anymore, although most modern upsampling CD players will fill those gaps nicely and make the effective analogue output signal hardly distinguishable from the hi-res result. Conclusion is that without the SACD and DVD-A development this improvement for the normal redbook CD would not have been achieved. And as said above, probably a lot of redbook CD’s are still made going directly from analogue to 44.1kHz and sound therefore mediocre. hello….has the new cd players made improvements in cd sound as far as more accurate delivery? I don’t know who to believe anymore with all this external DAC talk and stuff. What amazes me in a quisitve way is that many of the improvements made in video is clearly detectable…no blind test (sorry for the pun) necessary. If Hi Rez was really what it purports to be, there woulden’t be any need for blind tests…we’d all go WOW..but we don’t..so, using that logic, it’s not an obvious, if any, improvement. A good thread, attended by individuals who really want the truth. But Robert Harley’s comments are profoundly discrediting. I don’t know Mr. Harley and had no prior reason to like/dislike or respect/disrespect him. Now I do! To summarily indict double blind investigation (widely viewed as viable method of inquiry) as baseless, then follow with an absurd fish cartoon speaks volumes about his qualification (i.e. lack thereof) to even participate in this forum or in others of its kind. Let’s have him tune up his golden ears and subject them to scientifically viable scrutiny. Until then, I’ll ignore everything he writes.